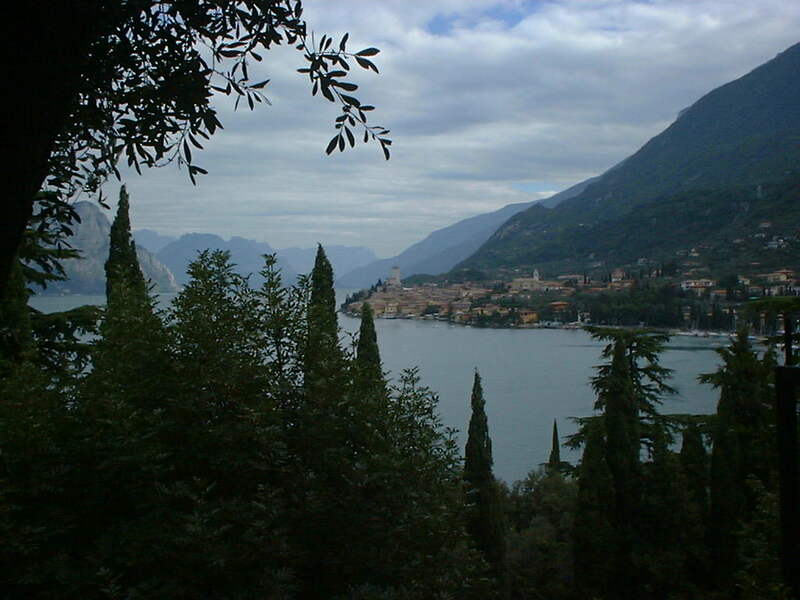 We stayed at Malcesine on the west shore of Lake Garda. 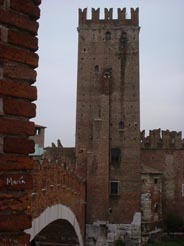 There is a Scaligeri castle in the old town which can be seen in the photographs. The old town has winding cobbled streets which are traffic free. Monte Baldo towers above Malcesine and you can take a cable car to Tredspin. From there you can walk along path 651 to Cima Pozzette (2132m) and then on via the slopes of Cima del Longino to the summitt of Cima Valdritta (2218m). 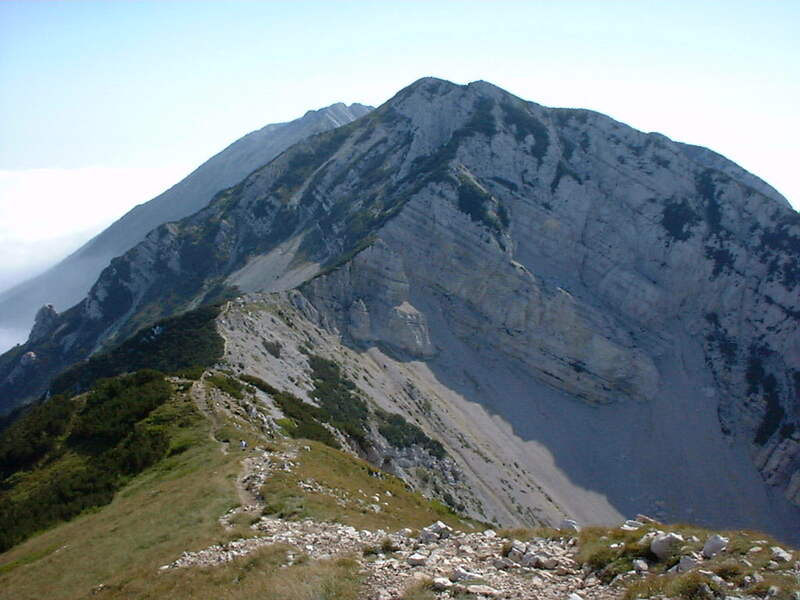 The photograph on the left shows the view from Cima Pozzette looking towards Cima del Lingino and Cima Valdritta. On a clear day there are great views of the Lake. This walk is featured in Walking in Italy by Helen Gilman. 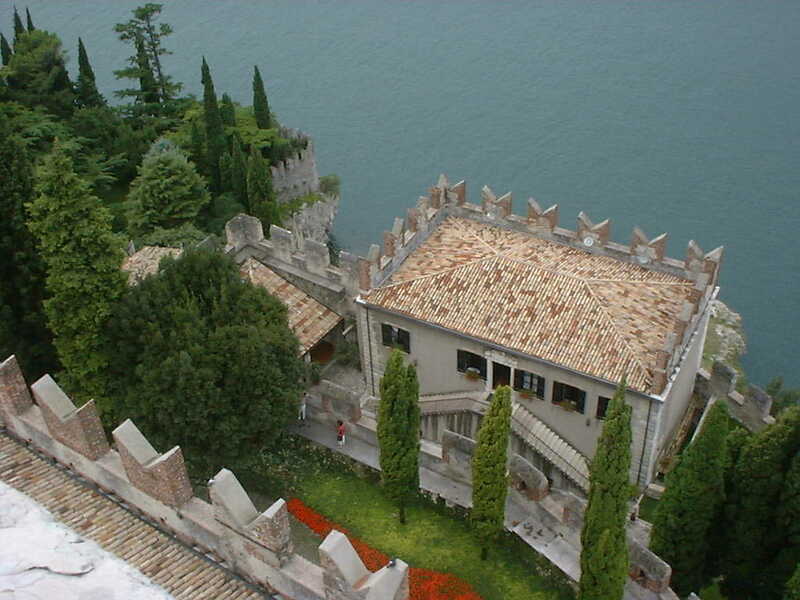 Sirmione is on a narrow peninsular jutting out from the southern shore of the lake. It is a very picturesque place and can be crowded in the height of summer. 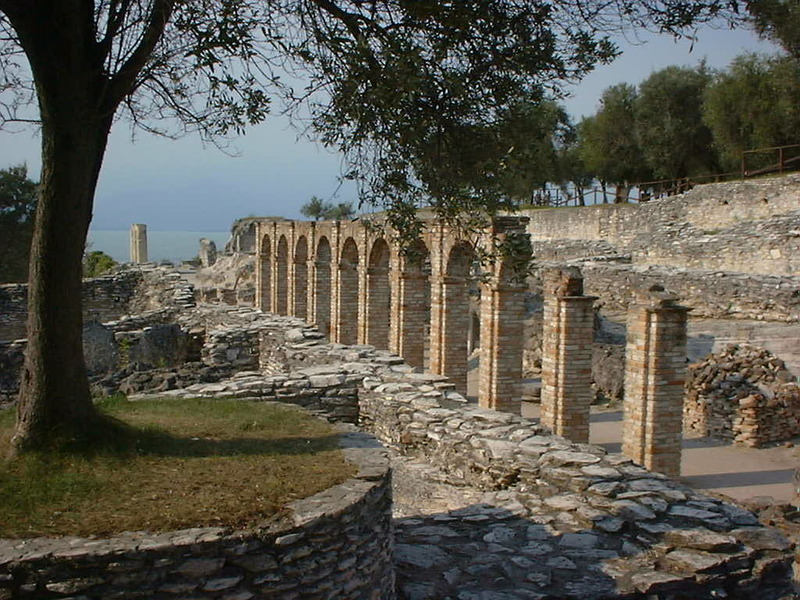 The Roman Villa (left) and baths known as Grotte di Catullo are named after the roman poet Cattullus. The extensive ruins are on the northern, quieter end of the island. 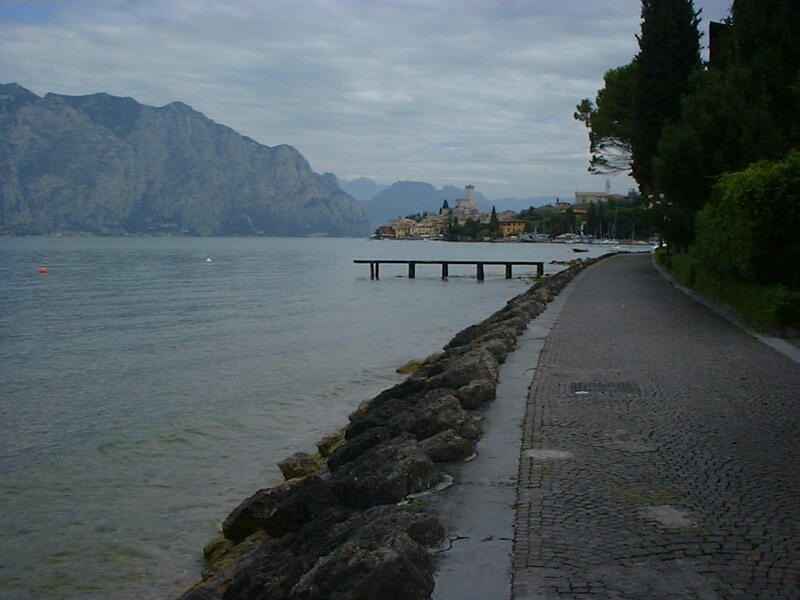 The Italian Alps are north of Lake Garda, Riva del Garda can be used as a base for exploring them. 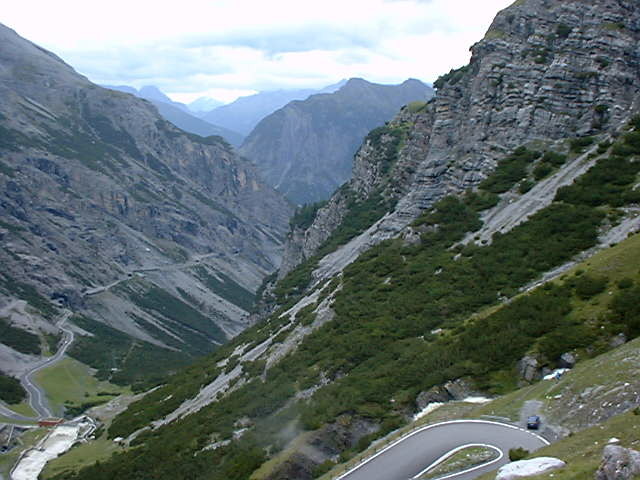 The Parco Nationale Dello Stelvio is good for walking and features one of Europe's most spectacular roads, a series of tight hairpin bends with steep gradients. This is the Passo dello Selvio which is the second highest pass in the Alps. It is approached from Trafoi which marks the start of 15km of hairpins. The picture on the left shows the view from the top of the pass looking south towards Bormio. Another drive is the 'four passes drive', leave the A22 motorway north of Bolzano at Val Gardena exit and follow signs for Val Gardena. Here you circle the Gruppo di Sella taking in the Passes of Selva, Campolongla, Podoi and Gardena. The picture on the right shows the view from the Passo Gardena. There is a full day walk in this area starting from Ortisei which is detailed in Lonely Planet's Italy guide. 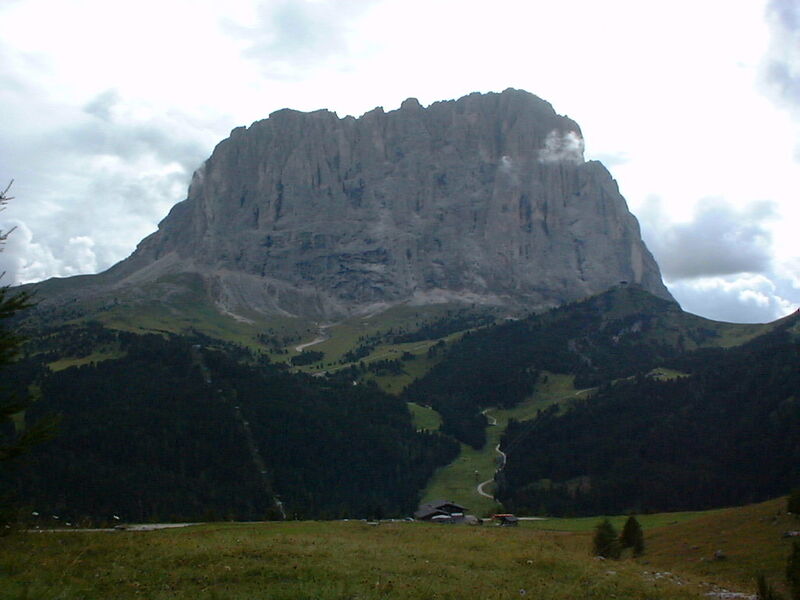 There is also a longer five day trek featured in the Walking in Italy book described above. 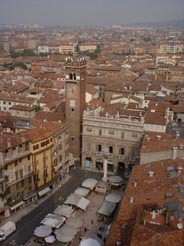 The old town of Verona is small and can easily be seen on foot. The Piazza delle Erbe (left) was originally the site of the Roman Forum and forms the centre of the city today. The square is lined with some of Verona's most sumptuous buildings. Across the river by the Ponte Pietra is the Roman Theatre which was built in the first century AD. At the back of the theatre is a lift to the convent above which house the Museo Archeologico. 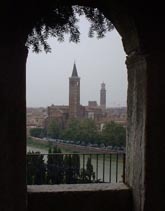 The photograph on the right was taken from the Roman Theatre looking back over the river towards the old town of Verona. Castelveccho on the banks of the Adige river (left) is the 14th Century fortress of the Cangrande II. It houses a museum with a diverse selection of paintings. The Ponte Scaligeri spanning the Adige river was rebuilt after being destroyed in WW2. The Roman Arena is the ampitheatre built in the 1st century AD which is now Verona's opera house in the summer. It is situted on the bustling Piazza Bra. 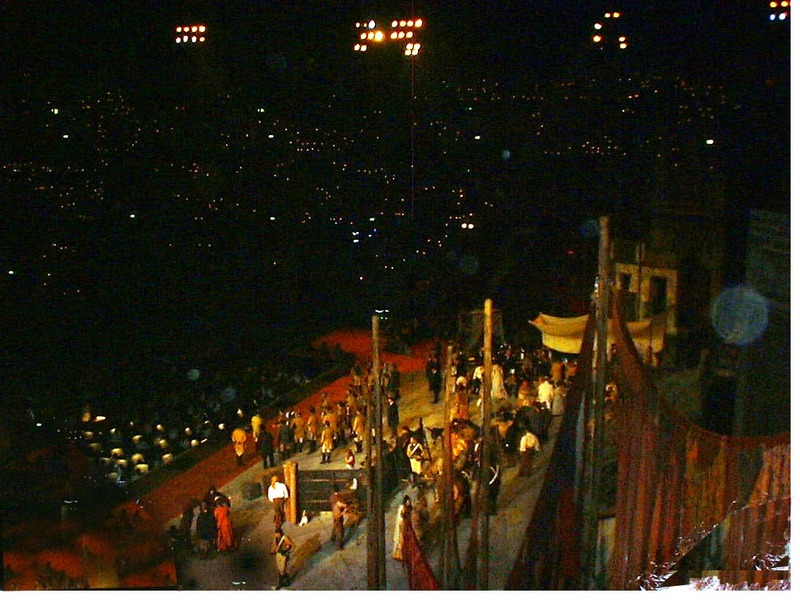 The photograph on the right shows a production of Carmen at the Arena. 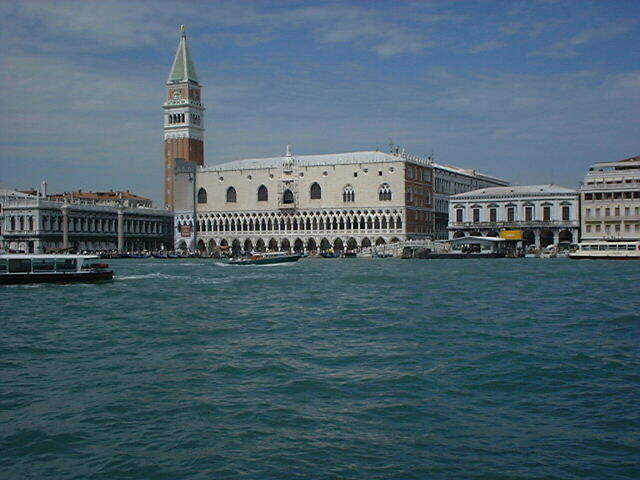 We arrived in Venice by Vaporetto from Tronchetto and approached San Marco by water from the lagoon (left). Whilst Venice and St. Mark's square were busy and there were queues for St. Mark's Basilica, the Doges palace was remarkably quiet. Perhaps the L16,000 entry fee kept people away. Each room has a description in several languages giving information about the palace. We crossed over the Ponte Sospiri - Bridge of Sighs - (right) which joins the Palace with the Prisons. The bridge is named after the sighs the prisoners made as they were led from the courtroom in the palace via the bridge to the dungeons.